*NOTE: Wilkinson Sword ceased trading in 2005. Henry Wilkinson benefited from a good education, excelling in the sciences, and counted among his friends the discoverer of electricity, Michael Faraday. 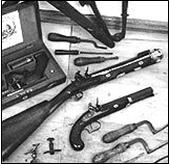 His interest in weaponry made him an international authority on arms. Among the books he published were Engines of War (1841), and Observations on Swords, published in 1848, which ran into 21 editions. 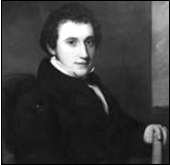 Soon after taking the business over from his father, in 1824, Henry Wilkinson made a shrewd move - relocating the company next door to the Board of Ordnance in Pall Mall. Like Henry Nock, Henry Wilkinson worked very closely with the Master General of the Ordnance. He carried out much experimental work with guns, and began developing many new patents. Wilkinson knew that the rival swords of the day lacked the strength required for battle, with many of his military customers dissatisfied with their weapons. Working closely with his customers, he started to experiment with forging blades and performing tests in his bayonet workshops. As a result of Henry Nock's experimentation, a sword testing machine was developed in 1844. It is still used in the Wilkinson sword manufacturing process nearly 160 years later. The machine called the Eprouvette, tested swords and bayonets, exceeding the stresses and strains expected in battle. 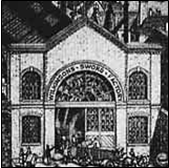 If the sword passed his rigorous test, it was given a proof mark and certificate, guaranteeing that he or his manager John Latham, had personally tested the weapon. Each sword was individually numbered and recorded so that owners, and their weapons, could be traced. As well as becoming Queen Victoria's appointed Sword and Gun Maker, Henry Wilkinson's list of customers grew rapidly to include HRH the Prince of Wales, the King of Naples, the King of Prussia, and numerous members of the House of Lords. By 1858, Henry's ill-health prevented him from being so involved in the company, and his manager, John Latham took on the business. A sword and fencing expert himself, he took Henry Wilkinson's vision forward. In this time, the company made a very determined move in the direction of sword manufacturing, as the government was expanding and modernising its own firearms factory, resulting in the reduction of many contracts. The crucial turning point came while the British Army were fighting in Sudan in 1885. It emerged that many bayonet swords were bending and breaking, thus resulting in the unnecessary loss of many lives. The scandal outraged the public and the Board of Ordnance took immediate action, leading to Wilkinson Sword being given its largest order ever, to manufacture 150,000 bayonets. After many years in the City of London, this large order prompted the company to starting looking for a larger factory, which it finally managed in 1899 when Wilkinson Sword moved to Oakley Street, Chelsea. By the turn of the century, they began to diversify into other products, notably their natural move into razor production, producing the 'Pall Mall' safety razor in 1898. 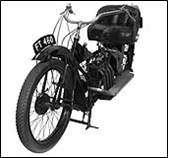 This was followed by the manufacturing of typewriters, bicycles, motorcycles, motor cars and a wide range of sporting and hunting equipment - the common factor being that each was the best quality and design at that time. The company moved to larger premises in Acton in 1903. During the first World War, this factory was engaged in producing over two million bayonets. 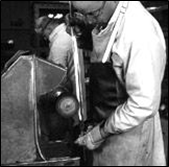 Later, during the second World War, Wilkinson Sword was given contracts to manufacture more than 10,000 bayonets. 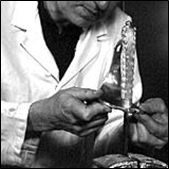 Following the centuries-old tradition of using swords to honour wartime glories, Wilkinson Sword was required to make many presentation swords during the war. Among the most famous is the Stalingrad Sword. 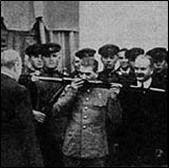 When the Russians defeated the Germans at Stalingrad - now Volgograd, in 1943, the British Prime Minister Winston Churchill decided to reward the victory and celebrate the Anglo-Russian alliance with the presentation of a sword. 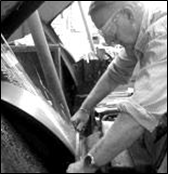 The forging of the steel blade was primarily the work of Tom Beasley - an 83 year old, leaving his sickbed to make the sword. He came from a family of sword-makers dating back over 250 years. Tom, a father of 23, had been making swords for Wilkinson Sword since he was 8 years old, and had also forged swords for Kings and Queens across the world. Churchill presented the sword to Stalin in Tehran, in 1943. A copy of the sword, which was on display throughout the country at the time, now rests in the Wilkinson Sword Museum. Josef Stalin receives the presentation sword from Winston Churchill. For over 200 years, Wilkinson Sword has continued to manufacture swords of the highest quality, ensuring that the legacy of Nock and Henry Wilkinson lives on. Not all swords produced are of military pattern and Wilkinson Sword specialise in the design and manufacture of unique swords for commercial presentation or to commemorate special events. 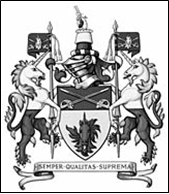 The sword makers craft is best expressed in the motto which appears on the Wilkinson Sword Armorial Bearings granted to the company in its bicentennial year: "Semper Qualitas Suprema" - Always the Finest Quality. The Wilkinson Sword Factory, c.1900. The blades were hand-forged from special high-carbon Sheffield billets smelted to their own specifications. Billets were hot-rolled on machinery that dated back to the 1850’s. Wilkinson Sword blades were ground on spectacular five-foot carborundum wheels to the correct section and profile – this process could take several hours to complete. Careful heat treatment (either oil or water) hardened and tempered the blade. 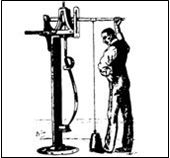 It was then tested for fighting-quality strength and flexibility on machines invented by Henry Wilkinson some 150 years ago. One of them bent the blade up to 30 degrees either side of vertical: each blade had to return to perfect straightness – or be rejected. NOTE: A sword’s "point of percussion" is where the maximum force can be delivered. Each Wilkinson Sword was subjected to a stringent strike test precisely at that point. Only those that passed were permitted to carry the Wilkinson Sword name and proof mark. The forged and heat-treated blade was hand polished to a mirror-finish, using progressively finer grades of polishing wheels. Steel or brass hilt components received the same painstaking attention to remove any small blemishes from casting processes prior to plating. Patterns, legends and insignia were acid etched onto the blade using traditional wax and screen processes by men with an average of 27 years experience. Wilkinson Sword pattern books dated back over 150 years. The proof mark, inset in brass or acid etched onto the blade, symbolised the strength of the armourer and proclaimed the authenticity of every Wilkinson Sword. Each of the Wilkinson blacksmiths "signed" his work with his own marking stamped onto the tang – the extension of the blade which locks into the grip. Hilts were assembled to the closest tolerances from a wide variety of hand-polished components, often gold-plated and always conformed precisely to the original designs. For presentation or limited editions they were also be embellished with precious metals, enamels or gemstones. The grip of a Wilkinson Sword was a work of art in its own right. For many of the models, sharkskin, rayskin or leather, was applied to a carved wooden core and then bound with gold or silver-plated copper wire. Others boasted a hand-carved grip in ebony or other rare hardwoods. It took several hours to hand stitch each rawhide scabbard, using natural leathers and yarns – and longer still to complete the curing process. Scabbard mounts were frequently hand-made, as for the Navy Flag Rank swords and Household Cavalry mounts. Finally, the scabbard was dyed and polished before being fitted with solid brass mounts, carrying rings and its protective shoe. 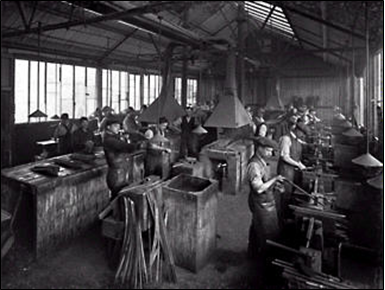 The Wilkinson Sword factory, located in West London, was an illustration of where traditional handcrafting techniques were being combined with the latest technology to produce optimum levels of performance and quality. 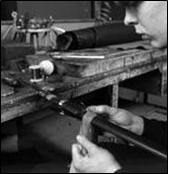 Each individual sword and scabbard passed through a number of stages of manufacture within the factory. Each craftsman applied their individual skill to an aspect of the sword or scabbard before passing it on to the next operation. This method of work involved a high degree of trust, with each craftsman depending on the work of his colleagues to create the perfect fit and finish. 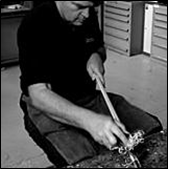 In the fifteen strong workshop there was over 150 years worth of experience in sword making including forging, etching, polishing, finishing and final assembly of the swords, scabbards and components. Each craftsman specialised in a particular process, having learnt skills passed down from previous generations, going back two hundred years. 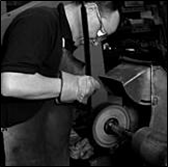 There were a number of father and son teams employed in the workshop and one staff member was the third generation of his family to have worked for Wilkinson Sword. This is another fine short film detailing the manufacture and presentation of a sword to General Dwight D Eisenhower in 1945. See it Here. Prior to 1788, there is very little evidence that other ranks’ swords went through a rigorous form of official inspection. Sword blades of that period are invariably unmarked, with the occasional maker’s name to blade edge or forte. Colonels of regiments were allocated a budget for the purchase of swords, and had total control over the choice of supplier and the pattern of sword to be issued. It is likely that they went for cheapness rather than quality. This led to instances of blade failure and consequent loss of life. After 1788, the Board of General Officers recommended that a series of proofs or tests should be applied to new swords. When a sword passed its test and was declared suitable by a government approved viewer, view marks were applied to the blade. 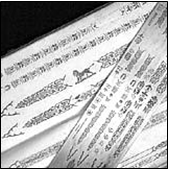 Initially, these were simple figures punched onto the blade, and comprised a crown above the digit. The government manufactory at Enfield, London, began producing service swords after 1820, and many blades are marked either “ENFIELD” OR “EFD”, with the year of manufacture, e.g. (18)“44”, following. Pre -1855, swords purchased by the Board of Ordnance are marked with a broad arrow and “BO”. After this date, they are marked with a broad arrow and “WD”, (War Department). Swords after 1855 have the pattern number stamped to the blade e.g. ‘/99 = 1899 Pattern Cavalry Trooper’s Sword. “X” indicated that the sword had undergone bending tests and those condemned as unfit for service were marked with two arrows facing eachother. 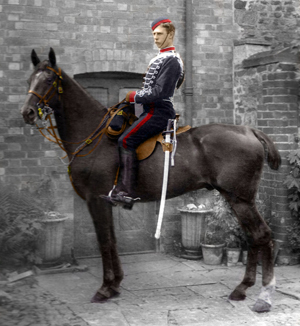 A Yeomanry Cavalry Trooper, c.1890. Here we find a contemporary account of the history of the British Militia System. Many thousands of Britons joined its ranks and the inevitable demand for swords was very high. 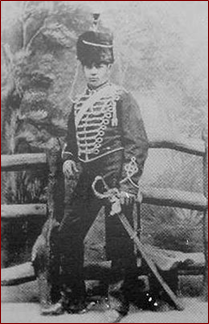 The 1827 Pattern Rifle Brigade Officer’s Sword is a familiar weapon for the collector and a great number were produced for both the town and village volunteer. This also excludes large quantities of swords passed on to both cavalry and infantry units by the regular army, when deemed unfit for active service. Although the subject matter of this article is not particularly sword related, it is still an excellent and dispassionate summary of the British volunteer movement, and a great insight into the typically “English“ and benign nature of its development and ethos. The purchase of a volunteer sword can also be the gateway to further research into these sadly neglected regiments who were once inextricably bound up with the social fabric of the British nation. The early years of the century found England in the possession of a large body of volunteers. They were not a part of the permanent military organisation of the country, but were raised in a hurry, and for a special purpose, and were only intended to meet a sudden emergency. At that period, Napoleon I had massed a great army at Boulogne in sight of the British coast; but the British cruisers held the Channel, and day after day and month after month passed, until the naval battle of Trafalgar put an end forever to his ambitious dream of the conquest of England. It was to meet this contingency that the Volunteers of 1803 were raised, and the danger having been averted, they were disbanded and never brought together again. With the organization and efficiency of this force, this article is in no way concerned, and it is only mentioned here to explain that volunteering for defense of the country is no new idea, but that the volunteers of 1803 have no relation to those of 1858. They served their purpose; they came together to the number of 463,000 men, and when the emergency ceased, they died out and disappeared. There is, however, one volunteer corps – the Honorable Artillery Company of the City of London – which is quite exceptional. It dates from the time of Henry VII, at which period it wore a picturesque dress, had nothing to do, and “did it very well;” and it consists of artillery, cavalry and infantry. It is not a “company” in the military sense, but has many of the attributes of the City of London companies, and has property and funds of its own. Until 1858, the Honorable Artillery Company was the only old-established Volunteer Corps. At that time, the country was thirsting for peace and rest. The Crimean War had disclosed a state of military disorganization in the army which had caused misery and disaster to the troops during the war, and it was felt that only the bravery and pluck of the officers and men had saved the country from actual defeat; but when peace with Russia had been obtained, no time was given for reorganization. The Indian Mutiny, following on the heels of the Crimean war, called forth all the resources of the Empire; but, when tranquillity was again restored, the public mind once more turned to the contemplation of army reform. ...soon became known that the would-be assassin had hatched his conspiracy and manufactured his bombs in England; and, in the excitement that ran like wildfire through the French army, a hundred French colonels signed a petition to the Emperor, praying him to put himself at their head and lead them against “Perfidious Albion.” It was not certain whether the Emperor would be able to resist the pressure thus put upon him, and the ugly fact of a possible invasion of our coasts stared us in the face. It was felt that our army – most of which was abroad – was inadequate to cope with the large forces which were at the disposal of France, if they should once gain a footing on our shores, and excitement little short of panic ensued. The people of England demanded arms that they might at least make a stubborn resistance, and the volunteer force of Great Britain sprang into life. In its infancy its constitution was hardly worthy to be called “organisation.” A large number of enthusiastic civilians of all classes enrolled themselves under officers who, for the most part, had little or no military training, and drilled and equipped themselves in isolated companies. All worked with an energy which only determination, coupled with a grave sense of danger, could inspire. Drill went on in every town in England and Scotland; rifle butts were hastily erected, and the first rudiments of shooting were taught by sergeant-instructors from the regular army. But in spite of all this activity the volunteer army was a mere “crowd of men with muskets,” without transport, without battalion formation, and with only one suit of clothes apiece; and with such a force the only rôle assigned to them was to rush to meet the enemy, to line the hedges and walls in inclosed country; to worry and annoy the invaders in every possible way, and to die fighting to the last in order that the regular army and the militia might gain time to assemble and make their dispositions for defense, The action of the French franc-tireurs in the Franco-Prussian War shows how much may be done by such means. While matters were in this state, the scare which had created the volunteer force came to an end as suddenly as it had arisen. Napoleon III, loyal to his alliance with England, succeeded in quieting his excitable colonels, and the danger of immediate invasion was averted. The sons of Sergeant William Cuffing of the Leicestershire Yeomanry Cavalry. Both were from farming stock and served in Captain Story’s ‘C’ Troop, c.1860. A slight advance was made by the scattered companies being formed into provisional battalions for purpose of drill, and being given a retired officer or militia officer as adjutant; and as they marched through the streets headed by the band, a crowd of street urchins ran beside them shouting such ribald cries as “Who shot the dog?” “How are yer poor feet?” and (to the mounted officers), “How much an hour for yer horse, gov'nor?” And when the battalion had reached its drill ground and deployed into line, the gamins formed line opposite to them, waiting, like the French line at Fontenoy, for the English to fire first. Then, as the rattle of the locks proclaimed the volley which terminated the “platoon” exercise, they fell down with shrieks and groans, and writhed in simulated agony of death on the battlefield, while the lookers on shouted with laughter at the performance. When the parade was dismissed each individual volunteer went home in a storm of chaff, and the clever pencil of John Leech made fun of them in “Punch.” How they survived this ordeal seems now a miracle; but survive it they did, and set to work with a will to increase their efficiency. It is obvious that an armed man – whether regular soldier or volunteer – is of little value for fighting purposes, unless he can shoot fairly well with a rifle; and the volunteers, recognizing this fact, proceeded at once to establish a shooting organisation throughout the country. The centre and head of this organization was, and is, the National Rifle Association, which held its meetings at Wimbledon until they were transferred to Bisley. 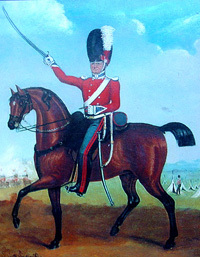 Quarter Master J. Kirk of the Leicestershire Yeomanry, 1841. In every county or district, an association was formed under “Wimbledon Rules,” which held its meetings once a year, and battalion and company meetings also offered a chance of winning prizes to those who were not sufficiently expert in the use of the rifle to compete at Wimbledon. Thus an inducement was given to every volunteer to practice rifle shooting, in addition to the class firing ordered by the volunteer regulations. The artillery have an association of their own called the National Artillery Association, which is quite separate from the National Rifle Association, and holds its meetings at Shoeburyness. It works on strictly military lines, and forms a camp where the mounting and dismounting of heavy guns, etc., as well as target practice, is a part of the regular training. This, briefly, is the organization which, with some alterations and improvements, has continued to the present day. The first meeting at Wimbledon opened on July 2, 1860, when Queen Victoria fired the first shot, with a rifle fixed in a rest and laid by the most experienced rifle-shot of the day, and the “bull's-eye” flag went up amidst the cheers of a large crowd of spectators. To promote shooting at moving objects, a life-sized stag made of iron was mounted on a small railway, and ran down an incline on one side of the range, and nearly to the top of the incline on the other side, on the principle of a switchback railway, the shot having to be fired between two white posts, thirty yards apart. Sir Edwin Landseer, the celebrated animal painter, drew the stag life-size, and this splendid sketch and the “Queen's” target are preserved by the National Rifle Association as their two most valued treasures. In the year 1883 a team of the American National Guard came over to England to shoot against an English volunteer team. At the beginning of the match, the visitors gained a considerable lead; but at the long ranges the English team not only wiped out their loss, but succeeded in securing a hard-fought victory. In the evening both teams dined with the president of the National Rifle Association, on which occasion there were present Her Royal Highness the Duchess of Teck, the Duke of Teck, and the Hon. J. R. Lowell; the Minister of the United States in England. After dinner the rule of the association that no speeches are to be made was so far relaxed as to allow of the health of the American team being proposed by the president; and Mr. Lowell, in returning thanks for his countrymen, made one of those short and happy speeches which did so much to promote a cordial feeling between the two nations. He said on this occasion: “May God grant that in all rifle competitions between the two nations, all the rifles may always be pointed the same way” - a sentiment cordially echoed at the present day on both sides of the Atlantic. Englishmen noted with interest during the late war of the United States with Spain, the readiness with which volunteers came forward in large numbers and at very short notice to serve their country. English volunteers in particular observed with admiration their cheerful endurance of thirst, hunger and privations of all sorts, in occasional circumstances of peculiar hardship. That they should show courage in the field was taken for granted; but that with such short training, and in spite of hasty and, in certain cases, inadequate equipment, these citizen soldiers should develop such splendid qualities of discipline, self-restraint and self-reliance was the subject of much and hearty praise among English military critics. The system pursued by the National Rifle Association has worked well, and although it is described as “pot-hunting” by those who wish to decry it, it has produced many first-rate shots, and may fairly claim to have carried out the object for which it was formed. It would be impossible in the limited space of a magazine article, and would be tedious to the general reader, to treat in detail of the improvements in organization which have been carried out, from time to time, in the volunteer force; but a few words on the present state of the force may not be out of place. The battalions are now united into brigades, commanded by brigadiers who have most of them served in the regular army, assisted by brigade majors, who are all retired officers, and a sufficient staff. These brigades assemble yearly in camp, and when at Aldershot or any other military centre come under military law, and take part in field days with the regular troops. The men learn all the duties of camp life; to pitch and strike tents, to cook and to make themselves at home in camp. A hearty and cheerful spirit animates all ranks, and the men look upon the annual training in camp in the light of a holiday, and are cheerfully prepared to perform readily all the various duties in return for the change of scene and work, and amusement and relaxation after the parades are over for the day. As to their fighting qualities, it can only be said that they have never been tested, but there is no reason to believe that they would fight with less pluck and determination than any other men of the Anglo-Saxon race. In case of emergency, they would fight in their own country for all they hold most dear, and history has proved over and over again that men fighting under these circumstances are not to be despised, even by the best-disciplined and most highly trained troops. As regards “discipline,” that word which may mean so much or so little, it must be remembered that the average volunteer lives a disciplined life. He is not a raw boy taken from the ploughshare, nor is he a young man of fast habits who has got into some minor scrape; but he is a respectable tradesman or superior mechanic, who has a character to lose, and I have myself seen a man, when brought up for judgement in camp, tremble and turn pale at the thought of being dismissed from the service, or sent out of camp in disgrace, which, when not camped with regular troops, is the only punishment the commanding officer has power to inflict. Such a man returns to his native town or village with a mark against him. He gets “chaffed” by the men, and - what is more important - is despised by the women. It is known that he has failed to acquit himself with credit in a duty which he has voluntarily undertaken to perform, and he has to bear the consequences. From want of experience a volunteer sentry will, from time to time, present arms to a showy uniform, and a smart non-commissioned officer of cavalry in full uniform will receive greater honor than a general in a blue coat; but this comes from want of knowledge of details, and not from want of discipline. A simple and practical form of drill has been introduced, which is far better suited to the volunteers than the slow, antiquated drill of thirty years ago. It is easily and rapidly acquired, and thus time is available for the teaching of outpost duty, advance and rear guards, and many other details of which in their infancy the volunteers were profoundly ignorant. 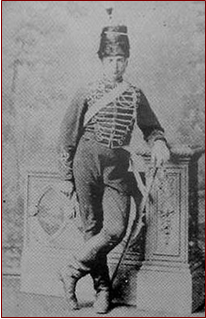 The officers of the new school now at the head of the army, who no longer cling to old traditions because they were good enough in their youth, recognize that modern weapons have altered the conditions of warfare, and have long ago discarded the drill of the time of the Duke of Wellington, who for many years opposed the introduction of the percussion musket because he said “the men would fire away their ammunition too quickly.” The volunteers are now recognized as an integral part of the defenses of the country, and in consequence panic from fear of invasion is now unknown. The necessity for conscription, which is hateful to the country, and now only exists in a very mild and modified form in the militia ballot act, which is never carried out, has been averted, and it is therefore fair to claim that the volunteers carry out in an adequate measure the purpose for which they were raised, and England sleeps the sounder for the knowledge that the manhood of the population is armed for her defense. The care and preservation of antique swords and edged weapons is not an easy task. Here are some Top Tips for their proper care and preservation. The first thing to remember is that the correct care and preservation of a sword is not an easy task. Many a fine sword has been ruined by overzealous cleaning and poor attempts at amateur “restoration”. It is sometimes better to just leave your sword alone and accept its current condition rather than botch the job and make it look even worse! If you are not sure about how to preserve your antique sword and don’t feel confident that you have the necessary skills to complete the job to a competent degree – ask someone who does! This “someone” might be a fellow collector with past experience of restoration or perhaps a dealer who will be able to tell you whether they know someone who can make a professional job of it. As time goes by and your experience of collecting increases, you will meet people at fairs, auctions and even on the internet, who can offer sound advice and point you in the right direction. Remember that they will be speaking from years of experience, including mistakes that they themselves made at the start – I include myself in that list! If the restoration job is complex, it is always better to hand over your sword to an expert restorer. Expert restorers can be found through word of mouth via dealers and collectors, and some advertise through related militaria journals and magazines. There is also a lively circle of dealers and collectors who speak to each other through internet web sites devoted to collecting edged weapons and they are always more than happy to exchange tips and contacts. An excellent and friendly antique sword web site that I regularly use for help and advice is www.swordforum.com. There is usually somebody on the forum who can help. You might think that after digging deep, saving up and paying a considerable sum for your sword, the very last thing that you would wish to do is spend even more cash after you have handed over your hard-earned money. This attitude is wrong. If you intend to keep, preserve and build a fine collection of antique military swords and edged weapons, extra money spent on their on-going preservation will prove to be a sound and ultimately wise investment over the coming years. Don’t Worry - You can try it Yourself! Please be aware that I certainly do not mean to frighten away the collector by saying that they cannot or should not do any kind of preservation work on their antique sword. Far from it. An expert is normally required when there are complex or detailed areas of preservation or restoration work. This is particularly so when the sword has to be taken apart or broken parts need to be repaired or replaced. I have visited too many auction houses and antique arms shows in my time and witnessed at first hand the results of amateurish botched repairs to blades, hilts, grips and scabbards. Here are some basic emergency repairs that are relatively simple to undertake but vital if wishing to stem the ravages of time, and ensure that the sword does not deteriorate any further and impact on its value and your investment. One of the fundamental problems that you a collector of antique swords normally encounters concerns the accumulation of corrosion e.g. rust. The use of a Break Free oil which dislodges the rust is recommended. In the United Kingdom, we have products such as WD40 and there are equivalents both in the USA and worldwide. NOTE: don’t ever use these oils on blades with blue and gilt decoration as it has been known to loosen the gilding and that would be a catastrophic and irretrievable situation. Personally, I would avoid any major contact with a blue and gilt blade but alcohol or kerosene is light enough to clean these delicate blades. When completely wiped clean a covering of fine carabellum wax can be applied. This provides a protective seal which keeps out damaging moisture. There are a number of specialist waxes on the market for the preservation of the metalwork on antique swords and edged weapons. 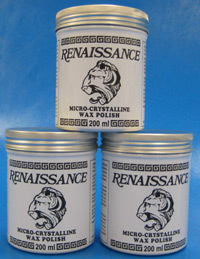 I can recommend Museum Wax or Renaissance/Becketts Wax. All of these specialist products are available from hardware or gun supply shops, and a quick trawl through the internet will also locate a number of merchants who can probably supply mail order. One jar is usually enough to last a very long time. Vaseline petroleum jelly or pure mineral oil/gel will also protect the blade from future moisture. It is important to note that you will need to inspect the sword on a regular basis (at least every month) to see if any rust or corrosion has returned. Some swords have very heavy areas of deep rust where the use of a Break Free might not be very effective and other options need to be considered. 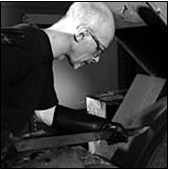 In these cases, a very fine abrasive might be an option, but you must decide whether the blade etching or hilt/scabbard plating might actually be damaged or worn away by this abrasive method. How do you want the Sword to Look? Ultimately, it all comes down to how you want the sword to look and there are some collectors who cannot resist removing the age or patina of a sword because they believe that a highly polished sword is more attractive. That is their personal choice. Thankfully, there are not a great number of these individuals but the result of this approach is that you will continue to see swords that have been polished to a gleaming state and I am afraid there is very little that you can do to return its character other than wait many years for the polish to dull! Do not let this be a reason not to buy a particular sword. I would rather acquire a highly polished but rare piece, than none at all! Constant and irresponsible handling of an antique sword will ultimately endanger its condition, especially when moisture from hands comes into regular contact with the blade or hilts. Any collector of antique Japanese swords will testify to the permanent damage done to a valuable blade that can result from finger marks that have not been immediately removed. It might be a good idea to acquire a pair of lint free cotton gloves that will ensures that the sword is kept dry when handling. NOTE: invest in a couple of pairs. This ensures that there is a spare pair on hand when that inquisitive friend or family member pays a visit to see your collection. A soft bristle toothbrush and some ammonia detergent or soapy water is quite effective in rooting out dirt and grime from recesses in both sword hilts and scabbard mounts. Remember to avoid being too vigorous and avoid losing any of the original gilding - do not use any abrasives in this area. Use a good leather care product on grips and scabbards to avoid them drying out and so becoming brittle or flaky. Your leather care product should have a high wax content as this will act as an excellent long term anti-drying sealant. Regular inspection of leather fittings should also be done in conjunction with the inspection of the metal parts. For the care of fishskin grips I recommend a little baby oil to allow the material to breathe again. Do not rub too hard on these grips as they can be very flaky and pieces can easily become detached. Try not to display your swords with leather scabbards or grips too near areas of extreme heat, particularly central heating radiators. This will dry out leather scabbards and grips and probably cause them to shrink. I might be stating the obvious but direct sunlight will never be advantageous to an antique sword.